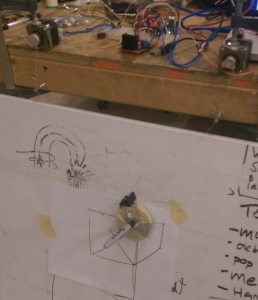 One of our members, Jeremy Rans, is currently working on a hanging pen plotter, i.e. a machine that draws on a vertical surface with a suspended pen. 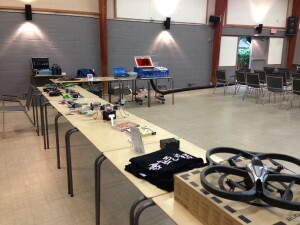 The inspiration for the project came from this article on Hackaday. The parts being used include two NEMA-17 stepper motors for controlling the X-Y position of the pen, two EasyDriver stepper drivers, a servo for lifting the pen on and off the drawing surface, and an Arduino Uno for controlling the motors. The main goal of the project is to make a plotter that can be easily attached to a wall-mounted whiteboard of any size. Most vertical plotters rely on the drawing surface being slightly inclined so that gravity applies the force necessary for the pen to write. Since that’s not really an option with wall-mounted whiteboards, magnets will be used to hold the pen against the board. The plotter will draw using G-Code instructions, a common choice for this type of device. So far, most of the work done that has been done has been on the software. 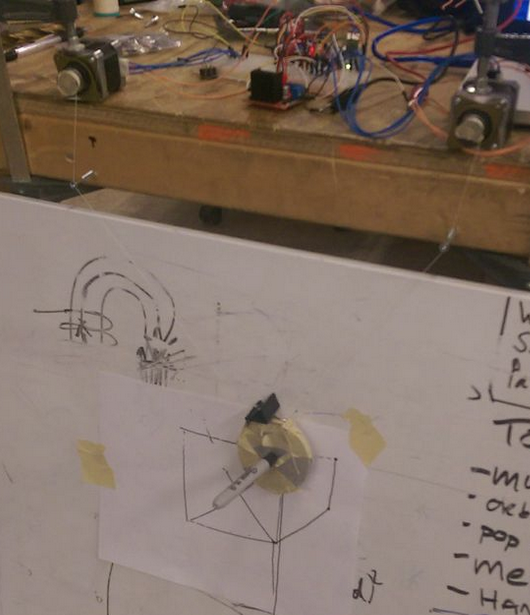 That includes the Arduino sketch for driving the motors, for which the AccelStepper library has been very helpful. AccelStepper allows for the stepper motors to be driven concurrently which cuts down on a lot of the math that would be involved in having to drive the motors one at a time. The other part of the software is a simple python program for reading in G-Code instructions and telling the Arduino how many steps each motor will need to take to satisfy each instruction. The software was recently tested with a quickly hacked together plotter which can be seen in action in the video below. With most of the programming work out of the way, the current focus is on the design of the pen holder, the motor mounts & the line guides. The line guides are basically magnetic hooks that the suspension line will run through at the upper left and right corners of the desired drawing area. This allows for the motors & other electronics to remain close together. Stay tuned for a future update in which we’ll feature the finished product! Saskatoon Techworks will be hosting an open house on Saturday July 19th in our space at 509A Gray Ave. The specific times have yet to be determined, but it will likely run something like 10am-5pm. 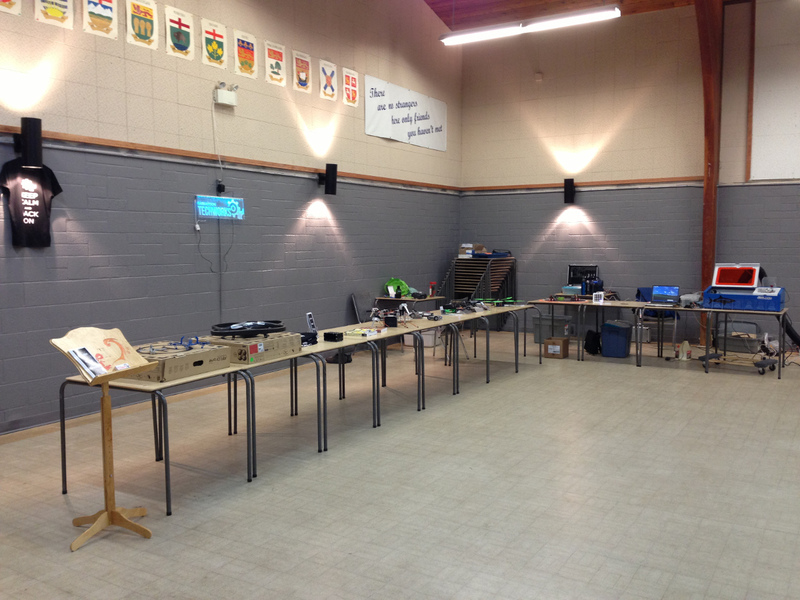 There will be several of our members’ projects on display and also some “hands on” activities such as combat robots (courtesy of the Saskatoon Combat Robotics Club). We’ll also have the BBQ running for most of the day so there will be food & drink available for purchase. More details to come closer to the date, but go ahead and mark your calendars! It’s that time of year again… join us at the space (509A Gray Ave) on March 11th at 7PM for our third AGM. We’ll take a quick look back at the past year, get an update on the organization’s financials, vote in the Board of Directors, and more. Third Space is the Charm! As of today we have officially moved into our third location, 509 Gray Ave in Sutherland. The space is considerably larger than what we had before, a necessity with our rapidly growing membership. We will post some photos as soon as we get settled. Congratulations Rylan! Peachy Printer Crushes Funding Goal! We’re ridiculously excited about the success of Rylan’s Kickstarter/Indiegogo campaign for the Peachy Printer. He was able to raise just over $700,000 which will go towards R&D of the printer and, eventually, production of nearly 5,000 Peachy Printers for backers. We’ll be posting periodic updates here regarding his progress, but for the news as it happens you should check out his website, http://www.peachyprinter.com. Also worth noting is that The Peachy Printer currently holds the title of “Most Funded Canadian Kickstarter Ever” as mentioned in the Kickstarter blog. Let’s see how long he can hold that title for! 7pm, 422 44th St E. Be there! This is a really impressive project put together by one of our members, Rylan Grayston. It’s a motion camera rig that is fully controlled using Blender 3D, an open-source 3d modeling and animation software. If the video below isn’t enough for you, you can read more about it here or here.